The Survival Code are a three-piece alt-rock band based in London, they combine passion, quality musicianship and rawness with dynamic focus. Their heavy drops and melodious breaks offer up honest distorted riffs and skilled songwriting, giving impetus to catchy ‘pop’ chords. Plunging guitars play against shadowy lyrics which adds an interesting contrast to their often upbeat rhythms. “Music is a form of storytelling, and it’s my job to make that story captivating” – Gary McGuinness, Lead Singer. The Survival Code blend both old school and contemporary rock sounds, listing the likes of Coheed and Cambria, Foo Fighters, Deftones, Alkaline Trio, Lamb of God, the Cure, Taking Back Sunday, SOAD, Billy Corgan, The Beatles and Jonny Cash amongst their influences. TSC played throughout London and beyond in 2011-2012, gaining a solid touring background and fan-base, before taking 20-months out to write and record the full album. A record deal with respected record label, IRL (Independent Records Limited) followed and all of a sudden there was a vehicle to release their music to the masses professionally. 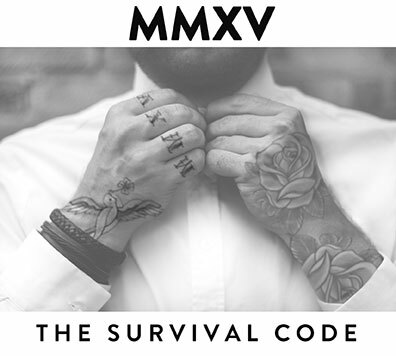 MMXV will be The Survival Code’s first official album release, and gets it’s worldwide release on the 20th July 2015. The album was produced by John Merriman of Crown Lane studios who works with orchestras and ‘big sounds’ and was mastered by Matt Hyde (Slipknot, Gallows, Ash, Machine Head, Funeral for a Friend) – striking a perfect balance of serenity and aggression, and presenting the band as an exciting new prospect.